Alvechurch midfielder Dave Bellis has completed his suspension. Picture by Steve Evans. 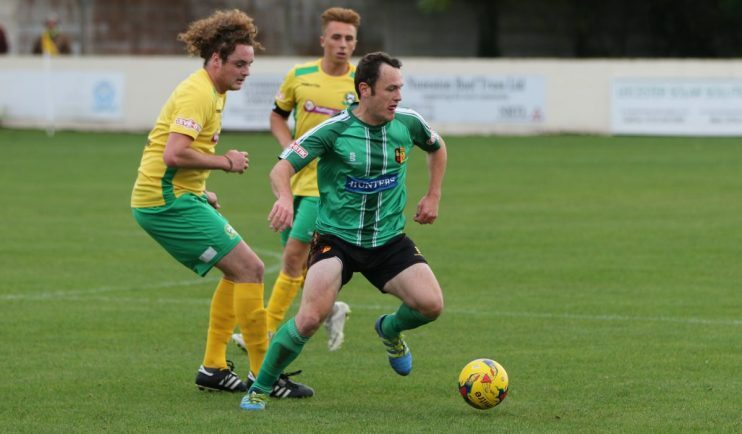 THE return of Jamie Willets and Dave Bellis will be a timely boost as Alvechurch look to maintain their promotion-seeking pace with two home games inside four days. Defensive linchpin Willets, who had a groin operation at the turn of the year, is ready for his comeback to step in for the suspended Ash Carter when Church entertain Rushall Olympic in Southern Premier Central on Saturday. Midfielder Bellis is also available after serving a three-match ban to help Ian Long’s side build on an impressive tally of ten points from the last four games. Tuesday’s 2-2 draw at home to play-off rivals Stratford Town left Church in sixth place – two points behind fifth-placed Biggleswade as they seek a third promotion in as many seasons. Such a record has also made Long a potential contender for the vacant role of Tamworth manager after Dennis Greene left the club after just five months in charge. Church will look to continue their charge when they face Rushall, managed by former Redditch boss Liam McDonald, on Saturday and then Suffolk side Leiston on Tuesday. “Jamie has been probably our best player this season so we’re glad he’s back,” said Long. “He has been excellent. With Ash being suspended, it’s really timely. Willets came on for the final few minutes in Tuesday’s draw with Stratford in a game which both sides could have won but ultimately a point apiece – in their sixth meeting of the season – was a fair result. Alvechurch hit the post through Mitch Botfield’s shot early on and then took the lead just before half-time, with Rahis Nabi steering a low free kick into the bottom corner from 25 yards. Although Stratford levelled through a Chris Cox header from a Ross Oulton free kick on 66 minutes, Alvechurch were back in front six minutes later. Josh Ezewele made a break down the right and Josh March skipped past his marker for Lee Chilton to tap home unmarked at the far post. Stratford, though, ended strongly and made it 2-2 with seven minutes left, Jimmy Fry tucking home a 20-yarder after Kynan Issac made the initial foray. Chilton has now bagged five goals since he joined from Sporting Khalsa and Long has been delighted with how he has settled. “He is energetic, he makes good movement and he provides a real threat,” said Long. On Saturday, Chilton had netted twice in an emphatic 3-0 win at St Neots Town. Kieron Cook, in his first appearance in 2019, headed the first from a free kick for the opener. Chilton then added the second – heading home from a Tom Turton cross on 67 minutes – and the midfielder made it 3-0 six minutes from time by slotting home after a swift passing move.